1. Blanch the trimmed asparagus in boiling water for 3 minutes then drain and run under cold water to cool. Pat dry. Dry fry the pine nuts in a small, heavy-based frying pan for 2 minutes until golden. 2. Preheat the grill to medium high. Mix half the pesto with the olive oil in a shallow dish then add the asparagus and toss together to coat. Arrange the coated asparagus in the grill pan. Grill for 4-5 minutes, turning, until tender and lightly charred on all sides. 3. Meanwhile, cook the linguine in a large pan of boiling water for 3-4 minutes until just tender. Drain thoroughly and toss with the remaining pesto. 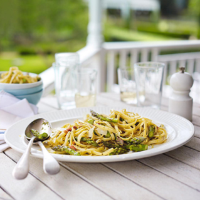 Cut the grilled asparagus into 4cm lengths then toss with the pasta, pine nuts, grated lemon zest and juice. Serve with shavings of Parmigiano Reggiano, if you wish.